A Happy Healthy Mummy: Is being healthy in my genes? Is being healthy in my genes? As any TV crime show aficionado will tell you (AKA me), DNA can be taken by using a 'buccal' swab rolled around the inside of your mouth. 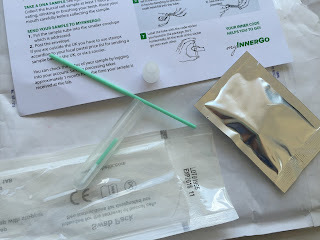 And so it was with gratuitous excitement that I followed the instructions on my MyInnerGo kit to provide the company with a sample of my DNA for genetic analysis. I then popped my swab into a test tube for safe keeping and into the pre-paid envelope provided so that it could be posted off to the lab. What exactly would I discover about my health and weight control potential? I was fascinated! If this all sounds a bit futuristic, that's because it is. Personalised medicine and genetics are an emerging practice that uses an individual's genetic profile as a guide to potential health and fitness. While lots of the lifestyle choices we take go on to decide our actual health, much of what we are - and what we can be - is pre-determined. Just consider that 40 to 70 per cent of body weight is affected by genes, and that genes also account for half of the variations in physical performance between individuals. Why waste time following a regime that just doesn't suit you - when with a little bit of self-knowledge you can find out what your strengths really are? 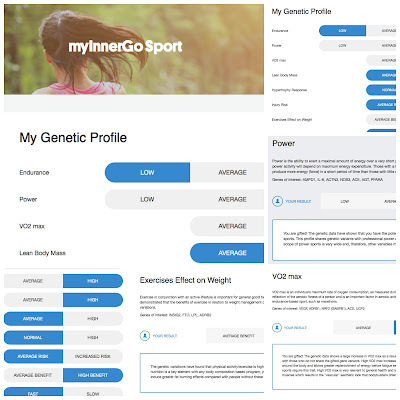 The myInnerGo tests can help match your diet and exercise choices to your genetic profile - and a more appropriate match means a greater chance of success, whether that be improved athletic performance, easier weight management or making sure you aren't deficient in certain vitamins and minerals (yes, your genes can even carry a susceptibility to being deficient in certain micronutrients). Choose a Sport, Weight or Vita (nutrition) program depending on your personal goals and interests. The ramifications of knowing your natural strengths and weaknesses are huge - are you likely to benefit from exercise, do you risk easy weight regain, can you eat carbs without piling on the pounds, are you likely to get injured, should you eat more protein, would you be better at sprinting or marathons? These are all questions a my InnerGo profile can answer. If you're serious about managing your weight, exercising to your full potential and eating smarter, then this information is the secret to all your inherited advantages. When my results were in, I was logging into my online account faster than you can say 'cutting edge science'. The results are illustrated clearly in chart form - with more detailed explanations available on the left of the page menu. In terms of weight management, my genetic profile revealed that I have a low risk of obesity and that when I exercise, I have a 'high benefit' in terms of the effect on my weight. My response to carbohydrates, unsaturated fats, calorie restriction and protein was all very average however - so that means I can eat a balanced diet without worrying too much - and that the key to weight loss would more likely be exercise than diet for me. On the downside I have an increased risk of weight regain and a higher than average waist to hip measurement (although this may be negated by the fact I have very narrow hips!). The results also provide complete section on recommendations and a three-day diet/meal plan A phone consultation with one of the myInnerGo experts was able to fully explain 'technical' terms and implications of results such as 'basal energy expenditure'. The Sport profile was even more illuminating. It showed that my ability to perform 'power' activities was high whereas my endurance level is naturally low. 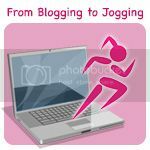 During my phone consultation with Chris, a member of the myInnerGo team, I explained I'd always assumed the opposite - I can happily plod along running for example for ages - but try and add in some speed work, and I'm beat. The secret lies deeper in my results as I have a high VO2 max rate (in fact the word 'gifted' was used) - which basically means my body allows greater replenishment of energy before fatigue sets in. My results show I benefit from a fast recovery time too. These two elements offset my endurance issues thankfully! While many of my other Sport results were normal and average, the results showed I do have some advantages in certain areas and even the potential to excel at power-based sports. A final part of the Sport genetic profiling was a look at which micronutrients my body might be deficient in. I had an average risk for most of these - including iron and Vitamins A, B and D - and a low risk of bone mineral density being poor. However, it seems I do need to pay particular attention to my Omega-3, selenium and magnesium levels, as I show a higher risk than average of being deficient in those. Chris was able to advise me on exactly how to keep those levels topped up. 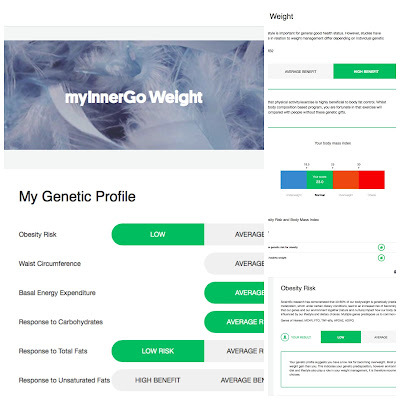 Overall I found the genetic profiling offered by myInnerGo interesting and motivating. It's good to know I do have some natural athletic strengths (I've always considered myself rather poor at most 'sporty' things) - and great to know that exercise for weight management can work for me. 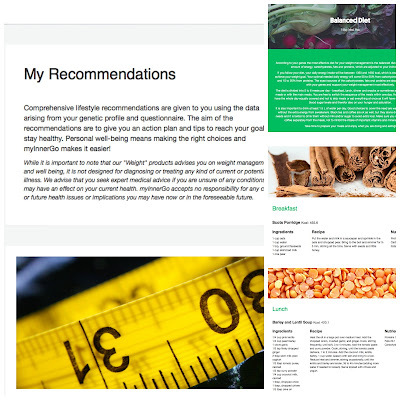 It's also reassuring to discover that many of my health results were 'normal' or 'average', which means a balanced diet is my best bet. The few micronutrients I might be deficient in can be easily topped up too. My new found knowledge about my 'inherited gifts' have certainly spurred me on to see if I can improve my fitness - and being told I have a naturally low endurance level has just brought out my stubborn nature to try and prove that bit wrong! And now it's your turn! 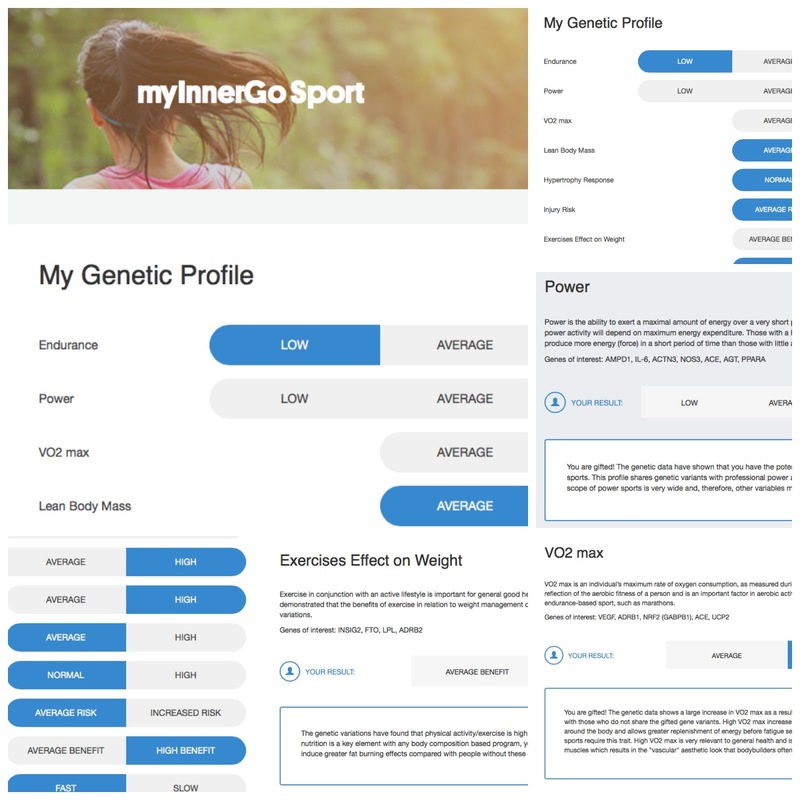 If you'd like to benefit from knowing your genetic profile (and see if you can turn it to your advantage for sports performance or weight management) you can get a 10 per cent discount with the code 'VANESSA'. Disclaimer: The myInnerGo products/services were provided to me free of charge so that I could write this piece. Fascinating stuff! But also a complex business as your experience showed with the 'endurance' issue.